Bathing your newborn for the first time makes you go nervous. If you had already been bewildered by how the midwives or the medical crew bathed your baby as they almost tossed it around with so much adroitness that you thought you would faint, then a simple bath at home with much more gentle mommy touch should not scare you! The only thing you might want to be concerned about is to know whether you are giving an optimum number of baths to your baby and whether you are using the perfect bathing soap for your baby. 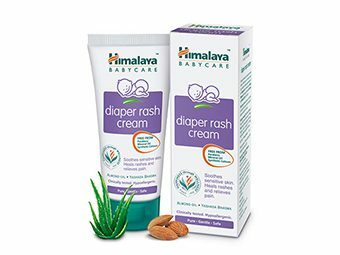 Himalaya’s Nourishing Baby Soap is a herbal formulation, specially developed for baby’s sensitive skin. It contains natural emollients like honey, sunflower, castor oil, and milk that moisturizes baby’s skin, and reduces itching and inflammation. 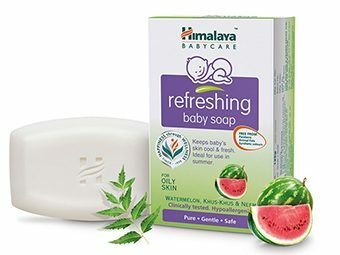 Ideal for use during the monsoon season, Nourishing Baby Soap is free from artificial colors. Rich in Vitamins A, C, D, and E, sunflower oil is excellent in helping baby’s skin retain moisture. The nourishing properties of milk also help in soothing and moisturizing your baby’s skin. Castor oil helps in reducing itching, rashes, and skin inflammation. 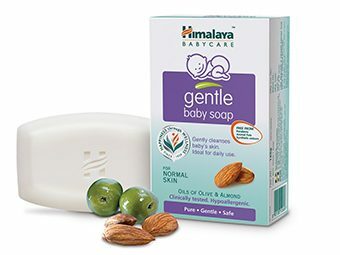 Rich in olive oil and vitamin E, Himalaya’s Gentle Baby Soap protects, nourishes, and softens skin, while also preventing chafing. 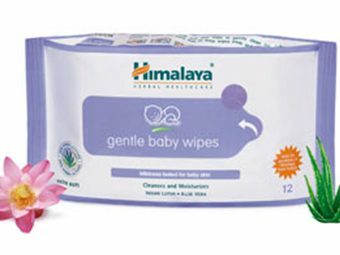 It keeps your baby’s skin healthy and soft. Almond oil moisturizes your baby’s skin and makes and excellent softener. There are plenty of baby soaps in the market that promise to have a gentle formula and to be hypoallergenic. But even these soaps contain ingredients that can strip your baby’s skin off the necessary moisturizer. Some of these soaps have also been known to contribute to cradle cap in babies that is characterized by the yellow scaly rash. As to how frequently you should bathe your newborn, it is the healthiest to bathe your baby at least once, if not twice a day. However, the habit of bathing babies on a daily basis also varies between different regions depending on the climatic conditions and the average temperature there. Those in the tropical regions are more likely to give their babies a bath every day. This is also true about regions that are exposed to constant humidity. 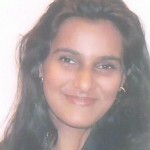 Heat and humidity can be very uncomfortable for babies and hence a bath on a regular basis is a must. However, scientists have begun to believe that a daily bath robs babies off their opportunity to gain exposure to a range of bacteria and therefore build immunity. The American Academy of Pediatrics says that infants up to one year old may be given bath three times a week because it is also likely that babies can dry out their skin if bathed more frequently. Washing your baby’s scalp is also recommended to be followed only a few times in a week. However, Himalaya’s Baby Shampoo keeps your babies safe with its ‘no tears’ formula and makes sure that it cleanses, softens, and nourishes your baby’s hair. 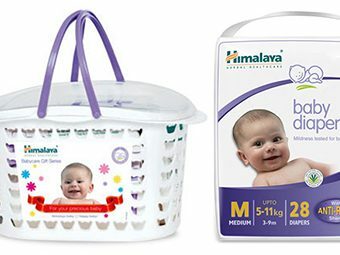 With the goodness of natural ingredients that constitute Himalaya’s baby products including its soaps and shampoos for babies, you are more than assured that both the hair and skin of your baby are cleansed, conditioned, and protected even for long after its bath. Therefore your baby can enjoy a tranquil daily bath with no side-effects whatsoever.